Although clinics operate on a smaller scale than hospitals, nevertheless they have similar organizational and financial requirements essential for success. It is not difficult for a patient to realize when a clinic is not operating efficiently and providing unsatisfactory services. In a situation like this, the clinic is not viewed as a high-performance organization and will have difficulty maintaining patient volumes, much less growing volume and increasing market share. 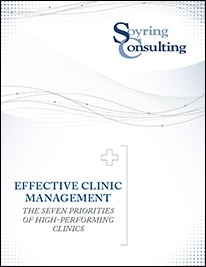 What are the Seven Priorities of High-Performing Clinics? Answer the question "Did the changes make a difference?"